In Waikoloa, Hawaii this week, there is the most remarkable collection of sessions and workshops. Whether eco-freak or mountain (wo)man, we can all regard with awe this mix of science, policy and wildlife management which is the US. Wildlife Society. The topics, sponsored by USGS, are so varied, they have to be laid out, end to end. The Bighorn (top image) is forced to overwinter in the high Tetons of Wyoming instead of its traditional low elevation areas. Human development has prevented normal migration and the sheep has replaced it with interesting quasi-migration behaviour that is thought to enhance their nutrition. They live at 10,000 feet on windy ridges and slopes, selecting these locations in order to avoid migration. The fences, roads, land conversions and habitat loss. Biodiversity metrics of, for example, terrestrial vertebrates. Soon to be national and enveloping more and more groups of animals, New Mexico State University researchers are producing multiple diversity metrics on subjects such as threatened and endangered species, "harvestable" species, total species richness, etc. All of the Southwest US was investigated and apart from the project's geographical enlargement, more metrics based on current analysis and stakeholder input will be added. Virtual disease transmission in virtual cougars and bob-cats. The spread of big predators between viable habitats is fraught with geographical and man-made hazards. Habitat fragmentation and huge industrial barrier areas come to mind. When, in turn, disease spreads in the organism, Colorado State University are testing "agent-based-models", based on the GPS data and behaviour of bobcats and cougars. The contact between con-specifics in Southern California is of special interest. The urban carnivore's population has health problems and the path by which pathogens are transmitted is one of the aims of the study. Saving "imperilled" butterflies from mosquito control measures. 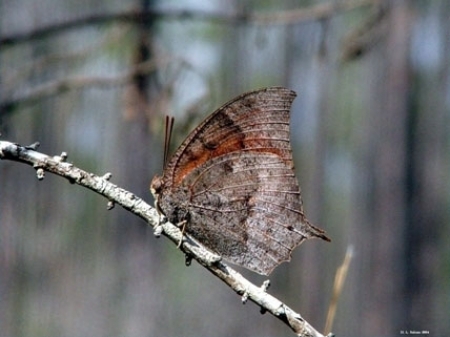 Both the Florida Leafwing and Bartram's Hairstreak are extinct over most of their original home ground. Of great interest to the entomologists spraying in mosquito control areas is how their methods affect such delicate situations. Preliminary findings produced a resilience in the butterfly species that mosquitoes fortunately don't possess. 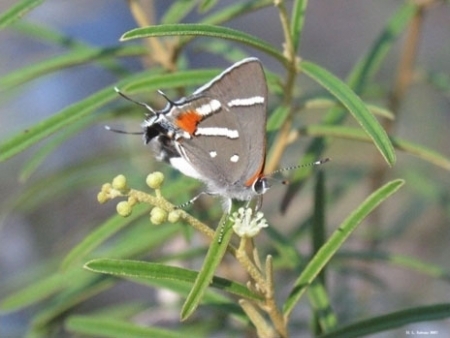 The National Key Deer Refuge is being used by USGS to use another butterfly as the test species, as total extinction is not a result they seek. Two years ago, ultrasonics were suggested to save bats from wind turbine fatalities in Pennsylvania. Manueala Huso is the prime agent entrusted with testing the acoustic device added to turbines with wind turbines not fitted with ultrasonics. There is so far, 60% higher fatality at the control turbines. USGS are also involved in the similar research on videography in low light on the so-called "non-linear" flight of bats! The answer is image processing with new software in Pennsylvania again, but also in Hawaii (some local interest at last). Near infra-red light tracks and quantifies the target bats' movement at 100 meters. Feasibility studies are well underway, helping both bats and nocturnal birds. There is a special bear population between Canada and Greenland. Without the security of summer land, a high natural survival rate has been recorded in this population (1997).With high recruitment, the future looked hopeful, but harvesting of polar bears in the area is common and their body condition has been deteriorating. So survival estimates over the last ten years may not have provided reliable data, because they are based on the killed animals. Results indicate lower survival and that tagging should occur every five years for precise measurement. Other polar bears have suffered from sea-ice decline and an optimal sea ice habitat has reduced in size in the Baffin Bay area. The writing is on the wall and also courtesy of IUCN and the Canadian Polar Bear Technical Committee.